The book of 4 Maccabees is a homily or philosophic discourse praising the supremacy of pious reason over passion. It is not in the Bible for most churches, but is an appendix to the Greek Bible, and in the canon of the Georgian Orthodox Bible. It was included in the 1688 Romanian Orthodox and the 18th-century Romanian Catholic Bibles where it was called "Iosip". It is no longer printed in the Romanian Bibles today. The work consists of a prologue and two main sections; the first advances the philosophical thesis while the second illustrates the points made using examples drawn from 2 Maccabees (principally, the martyrdom of Eleazer and the Maccabeean youths) under Antiochus IV Epiphanes. The last chapters concern the author's impressions drawn from these martyrdoms. 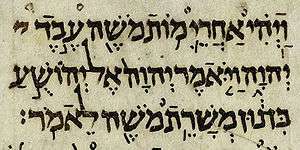 The work thus appears to be an independent composition to 1 Maccabees and 2 Maccabees, merely drawing on their descriptions to support its thesis. It was composed originally in the Greek language, in what Stephen Westerholm of the Eastern / Greek Orthodox Bible calls "very fluently... and in a highly rhetorical and affected Greek style." According to some scholars, the last chapter shows signs of later addition to the work, though this was disputed by the 19th century authors of the Jewish Encyclopedia. The dispute is based on the weak ending the book would have without the "added" chapter, as well as arguments based on style. The change of direction with chapter 17 supports the view of the work as a homily held before a Greek-speaking audience on the feast of Hanukkah, as advanced by Ewald and Freudenthal, where this would be a rhetorical element to draw the listeners into the discourse. Others hold that a homily would have to be based on scriptural texts, which this work is only loosely. In style, the book is oratorical, but not so much as 3 Maccabees. What can be interpreted as Stoic philosophy is cited by the author, though there is little original philosophical insight in the text. The writer appears to be an Alexandrian Jew who used a philosophical approach in order to present a concept of piety. Regarded as Jewish literature, it is cited as the best example of syncretism between Jewish and Hellenistic thought. The book is ascribed to Josephus by Eusebius and Jerome, and this opinion was accepted for many years, leading to its inclusion in many editions of Josephus' works. Scholars have however pointed to perceived differences of language and style. The book is generally dated between the 1st century BCE and the 1st century CE, due to its reliance on 2 Maccabees and use by some of early Christians. It has been suggested that it was written before the persecution of the Jews under Caligula, and before the fall of Jerusalem in 70 CE. The writer believes in the immortality of the soul, but never mentions the resurrection of the dead. Good souls are said to live forever in happiness with the patriarchs and God, but even the evil souls are held to be immortal. The suffering and martyrdom of the Maccabees is seen by the author to be vicarious for the Jewish nation, and the author portrays martyrdom in general as bringing atonement for the past sins of the Jews. ↑ The Access Bible (Oxford University Press, 1999), Apocrypha 330. ↑ History of opinions on the scriptural doctrine of retribution, Edward Beecher, D. Appleton & Company, 1878 (original), Tentmaker publications, 2000, ISBN 0-548-23111-7.